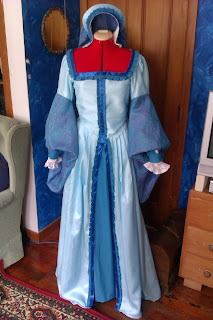 Even though the lack of beer sent my body into shock and I suffered a three-week long sinus infection-resulting cold, I have managed to finish that theatre costume, and am halfway through the wedding dress due in...two weeks and two days! It's for a play called Anne Boleyn, done by amateur theatre company Stagecraft. You can find out more about it here. **SPOILERS** - Don't read more if you don't want to find out spoilers for Downton Abbey S4! Now, I said in my last post that I was going to have a 'monster of an opinion piece', but I'm not quite ready yet. After that episode aired in the UK and sent shockwaves not only through the fan community but in New Zealand news, as it was the episode that featured Dame Kiri, I was disgusted and swore off my formerly-beloved Downton for good. After I calmed down though, I thought I would at least hear out how the storyline is treated in following episodes, and if there is actually a point to it at all. So, if you haven't already heard, Anna Bates is attacked and raped by a visiting valet. From the plot synopses that I've read, she refuses to report the matter to anyone but Mrs Hughes, and certainly doesn't confide in Mr Bates. This of course causes tension in the marriage and Mr Bates is hurt and confused by Anna's sudden change in behaviour. Not to mention the fact that a friend of the Crawleys has a monster as a valet and may visit the estate again... Now, the problem I have first of all, is why this plot has any place in this television series at all. You have to wonder at their motivations for including it. The audience has watched Anna and Bates struggle for three seasons with various troubles, and as soon as they find happiness, it's shattered. Why piss off your fans like that? What's the point? And with something as violent and horrid as THAT? But, as I said, I will wait and find out what they are doing with the storyline before I make a final opinion. If there is a point to it in the end, or a moral to teach or example to set, then I may reconsider. However I don't think an incident like that will at all warrant any moral or example the show could possibly offer in the end. I am very disappointed. I watch Downton Abbey for entertainment and aesthetics, and this storyline has neither. Not cool, Julian Fellowes, not cool.